The first day of the Lake Boyz trial did not disappoint. 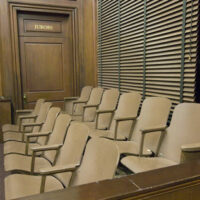 Although the courtroom is often the subject of entertainment and drama, actual court proceedings tend to be rather boring. That was not, however, the case for the first day of Lake Boyz trial. One lawyer had to be rushed to the hospital. One juror was booted off the jury. And just when you thought things couldn’t get any weirder, the power went out. The day began late after a juror and courthouse security got into a scuffle over a water bottle. The juror was summarily dismissed from the case after the altercation. But what is the case actually about, you may wonder. The Lake Boyz trial seeks to determine whether or not four young men are or are not gang members. The four men in question are James Brown, 23, Kwameaine Brown, 25, 21-year-old Diante Davis, and 30-year-old Eric Fletcher who is serving 30 years for a robbery he committed in 2012. The three who were not in prison were part of a 22-man roundup of the Lake Boyz gang that took place in January. This is the first of what promises to be many lawsuits targeting the Lake Boyz street gang. In a case like this, the prosecution must prove that the four defendants are, in fact, members of the Lake Boyz gang. The defense is countering that the four are simply from the same neighborhood, and being from the same neighborhood of a criminal enterprise is not, in fact, a crime. Needless to say, the prosecution must establish from their actions that the four defendants are members. The defense doesn’t need to provide an affirmative defense to this accusation. The defense’s job will be to open up the prosecution’s findings to interpretation. The prosecution will attempt to remove all doubt that there is any other reasonable interpretation. Prosecutors are using RICO as grounds to prosecute the men for unspecified crimes. So the question of whether or not they are members will make or break this case. On the other side, it’s one of the rare times when the defense attorneys don’t really need to put up a defense. Instead, they will opt for picking apart the prosecution’s arguments and evidence one by one. The prosecution’s argument will be cobbled together out of stories from police investigations and snitches alleging the destructive nature of the gang itself. Opening arguments revolved entirely around the destruction that the Lake Boyz had on their community, their drug dealing, their turf wars, and the death toll. In other words, there was not much tying the four defendants to the Lake Boyz. But that could come later. For the prosecution, producing one witness to identify the four men as gang members may be enough to put them away for a long time. But the defense attorney will simply say that they’re only being implicated based on proximity to where the gang operates. If you have been accused of a crime, call the West Palm Beach criminal defense attorneys at the office of Scott Skier P.A. at (561) 820-1508 or contact us online, and we can begin preparing your defense immediately.